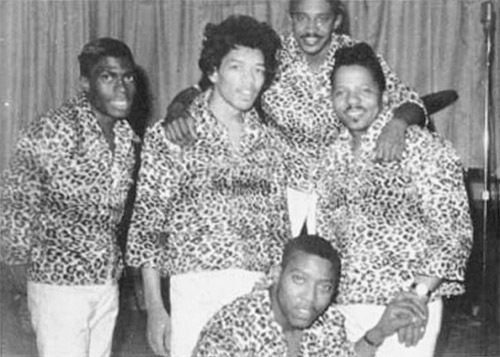 The pictures of the Squires on this page were supposedly taken at the Cheetah, Broadway & 53rd Street, New York City, hence the specially made "Cheetah skin" stage clothing. However, if you look at other 1966 photographs taken at Cheetah a couple of things do not quite fit. The stage at Cheetah was elevated so that the band was above the audience and the dance floor at the front. The shots of the Squires look like they would have been taken at the front of the stage but from an angle of someone standing higher than stage level. That would not have been possible at Cheetah unless the photographer was standing on a ladder or shooting from the back of the club with a teleobjective. A Teleobjective in turn would suggest a professional photographer but the pictures are fuzzy & out of focus, more like the work of an amateur with a pocket camera. 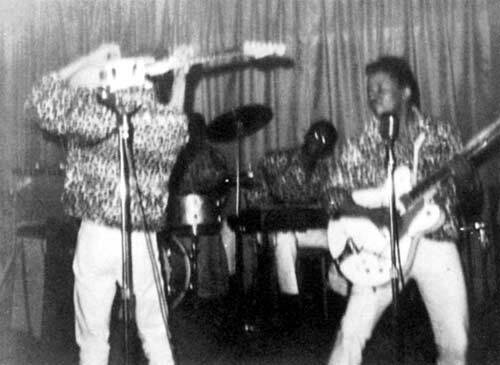 The backdrop behind the Squires is nowhere to be seen in the photos of the club, the back of the Cheetah stage was covered with mirrors. All the other live shots of the Squires show much more of the interior of the clubs and in some cases also several members of the audience. There is no audience to be seen in the Cheetah shots and the only thing that you can see of the surroundings is the backdrop. The band is tightly cropped against a neutral background so these shots could have been taken anywhere. 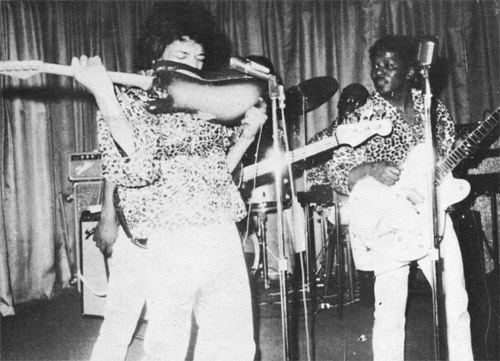 Also, photographs exist of Jimi wearing a cheetah jacket already in February 1966. 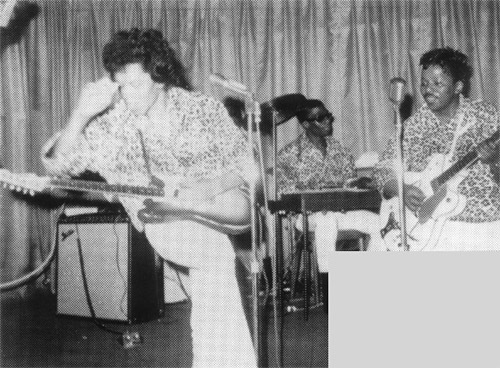 This casts further doubt on the claim that these pictures were taken at the Cheetah as, unlike stated by Curtis Knight, the jackets seem to NOT have been specially made for the Cheetah gigs. None of the comments made above rule out the possibility that they are authentic live shots from the Cheetah but there is very little to support that claim. For such a high profile gig one would have expected the photographer to also shoot the audience and the surroundings and the pictures don't have anything about them that says "Cheetah" except the band's clothing. So the shots may have been staged or they were actually taken at a completely different gig, probably in a small club. See the "Jimi Hendrix And Cheetah" -section for more information on the Cheetah club. The 10 June 1966 RSVP contract lists this line-up, and Curtis Knight identified the players from the pictures 1 (including "Hank", see also the personnel -section). 1 Recorded interview with Curtis Knight by Paul de Bie, Curtis Knight's apartment, Amsterdam, The Netherlands, 24 October 1994. Parts of the interview were published in Jimpress issue 39 (photo id part not included in the transcript but on tape).